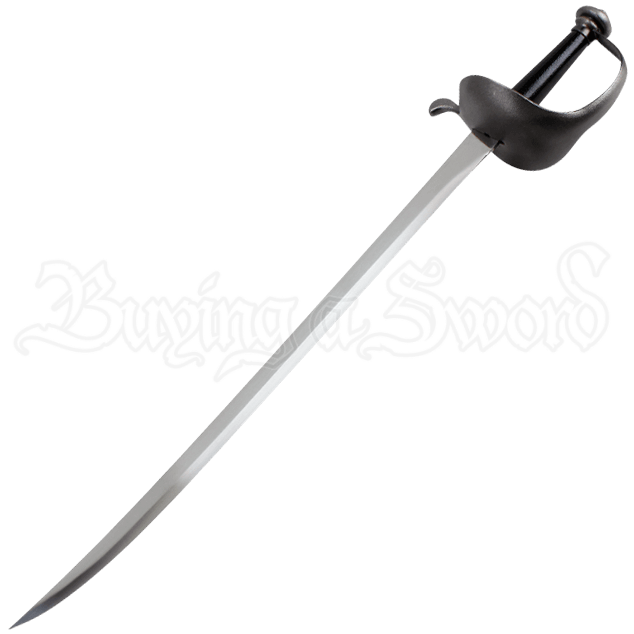 A swashbuckler ought to have a blade worthy of their cutthroat style. The Gunmetal Hilt Pirate Saber is such a sword, ideal for displaying your fearsome pirate spirit with its single edged, stainless steel blade and gunmetal hilt. The narrow saber blade curves slightly at its end. In dark metallic gray, the hilt features a wide, rounded crossguard with an arm that extends over the black grip, forming a knuckle guard that protects the hand of its wielder. The rounded pommel in matching gunmetal helps balance the blade and gives weight to this decorative replica saber. Detailed with matching dark silver tone fittings, the hard black sheath makes it easy to store and carry this steel pirate sword. Whether you have a fondness for all things pirate or are seeking a gift for your favorite scallywag, the Gunmetal Hilt Pirate Saber makes a fantastic addition to displays, sword collections, and pirate themed home decor.